The Pantheon (and by that I mean the overall MP stat stuff) has gotten an update. 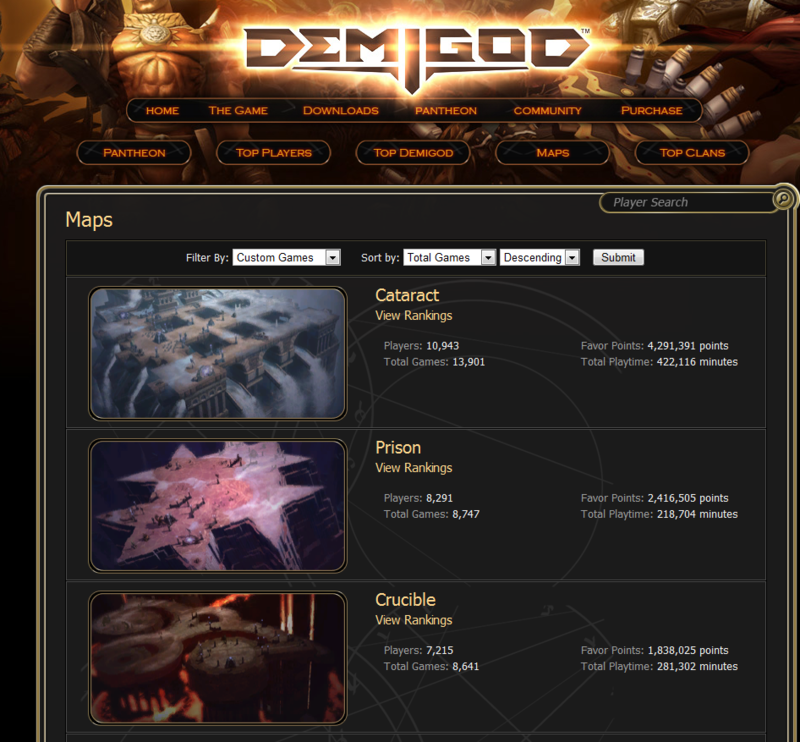 We can see that Cataract is the favorite map of players by far. Very nice, look forward to more changes. Gunslinger, I particularly love the graph. Stuff like this is so intuitive and easy to look at, understand, and read. It just makes sense, but is oft overlooked. Hopefully work with GPG can improve things like win/loss reporting, time in game, and disconnects. Careful, otherwise you might conclude that Crucible is the third most loved map. I think the problem with that quote, it is that it is the most played because there are only two 3v3 maps and 3v3 games are the norm at the mo. Both this map and Prison I find to be the most boring, but people play them because they are 3v3 centred. At a rough guess it seems to me that the most popular maps are the ones with the shortest travel from Citadel to front line. I guess I'm not alone in disliking The Brothers for that reason. BTW The Pantheon update is great with loads of stats on custom games!! The only downside seems to be that discos are counted as losses Shows me playing 2 games today, and that I lost 1. I had to disco from this game as one guy had 800 ping, then he dropped out and the rest of us disco'd as playing with AI is pointless. Cataract provides a perfect (or at least the best at the moment) balance for a general 3v3 game. I offers 2 alternate routes for players to level up fighting minions, plus 2 portals to increase minion flow. Both mentioned facts allow players variability in their positioning and with the addition of the 1 central flag (not a minion route), forces players to balance which side requires the most suppotr (2/3 demigods) and which can be held alone. The tug-of-war effect that occurs is the best display of Demigod's gameplay, blending long-term strategy with by-the-second tactical decision. The wide vareity and spread of the flags also allows teams who have been forced back into their bases to make swift captures to grab the neutral portals, allowing them to force the opposition to let up their attack and go on the defensive. It's not like most other maps, where once you've lost your first line of towers it tends to be downhill from there. Please examine Cataract well GPG and SD, while it's good to have vareity, following this maps formula is a sure way to making a balanced map. It's a nice balanced map...sure, but I think the main reason why Cataract is the most played right now is because 3v3s are the most consistant in terms of getting a game together. While I like Cataract, I also think it's borring. I like Brothers and Ziggurat more, but since they are large 5v5 maps, they are never played since geting 10 people to connect to one game, as we all know, has been a bit of a pain. Try doing a hard refresh (CTRL + F5) on that page. Also, it isn't a graphic, it's Flash-based. So if you do not have Adobe's Flash installed you will unfortunately not be able to see the graphs. Everything else should work fine though. Cataract: very good map, first beta map released. Promotes teamplay and has a somewhat easy structure that also allows for advanced plays and tactics. No suprise to see it on #1.
mandala: the game differs on this map because of its vastness. Quite suprised to find it up there but i guess once you get enough players it can be somewhat fun. Prison: An interesting map that differs the game because of its lack of defensive towers which is a huge deal in early game. It promotes diffrent play while being perfect for 3v3, a very good map. Brothers: This is probably the worst map of all, it just seems like you dont get any money on this map, thus less items, less deviation, less fun. Zigurat: No idea why this is at the bottom, personally i think its the best or at least top 3. A somewhat larger income makes it very interesting (diverse gear=fun). I guess it being a 5v5 map is somewhat misleading as its best played 3v3 due to the lanes being close by, the portals are well placed off the beaten pass and allow for pressure from more sides. For anyone reading this, try it as a 3v3 map and you will be suprised how much fun it is. Looks like Pantheon hasn't been played recently; Is that just a lack of data, or is Pantheon currently busted? I dont like the map. I also dont see a way to change what maps I can play or how many people I can play with. What version of Firefox are you running? What OS? Do you have the Flash plugin installed for Firefox? Is it Flash 9 or Flash 10? Where do you see that? According to the db, there are plenty of Pantheon games that have finished recently. 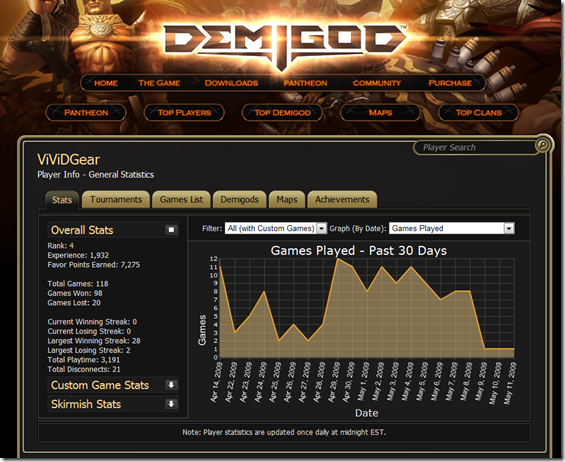 the graph you're looking at shows the number of games that the player ViViDGear has played over the last several days of all types. I'm not sure you can say it's the favorite. The majority of games with the connection issues up until now were probably 3v3. Out of only 2 maps, Cataract is the only one of the two maps allowing for team play strategy, Prison being a pure Demigod kill fest mostly. Even without MP issues, 3v3 will most likely continue to be the most played mode which means it is critical to add a new 3v3 map as soon as possible so people don't get bored of always playing the same thing. It could be argued we could play 3v3 on the 2v2 or 4v4 maps, but let's be honest, it's really not good. Good job on the graphs though, very well done. mhhh the new Current Standings statistics are very ugly, the old solution was much better !! 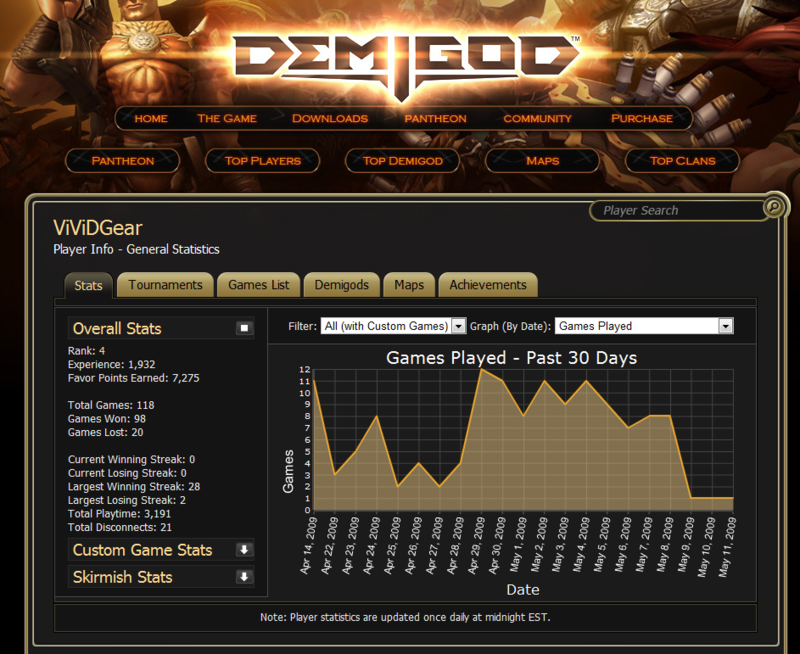 - Added graphs for each Pantheon tournament. - Added graphs for maps. 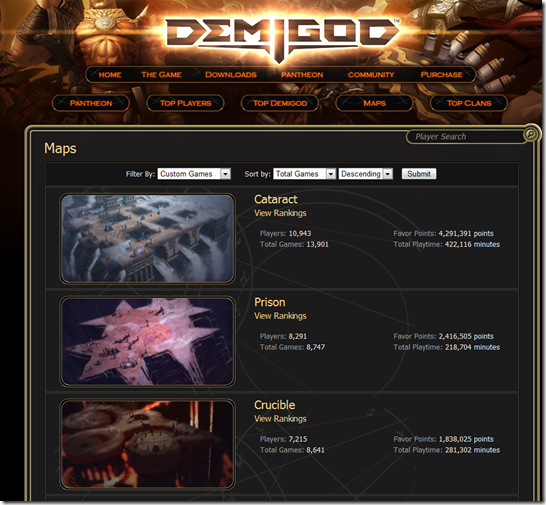 - Added graphs for Demigods. - More changes to back-end for API. Can we get favor item statistics in Pantheon Games I would like to see the imbalances in favor items used. (Favor should not be allowed in ranked play) Since some of us favor is still screwed up and are not gaining any to go up against a staff of renewal beast and can't even use the dispell favor item is completely imbalanced. I would list more examples but people would exploit more then the known other favor exploits. I doubt favor items would be removed, but they can be balanced with future updates.